Doniene Gorrondona is a winery located in the once famous Bakio region of the Basque Country of Spain. Itziar and Andoni, along with another friend from the region, have rehabilitated and modernized this ancient vineyard and winery. Doniene Gorrondona owns 15 hectares of vines, including a unique two-hectare parcel of pre-phylloxera Hondarribi Beltza. The vines are planted pergola-style to allow air circulation in this moist climate. The Bakio valley creates steep-sloped bowl that faces the Cantabrian Sea. 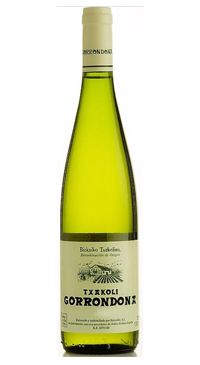 Hondarribi Zuri has been planted in the well-drained soils of these slopes. The vines are farmed organically and the wines are fermented using indigenous yeasts. Itziar and Andoni believe in creating wines that reflect their distinct terruño. Made from a blend of 85% Hondarribi Zuri, 3% Hondarribi Beltza and 12% Mune Mahatsa fermented in stainless steel with indigenous yeast. The wine is reminiscent of a refreshing Basque sea breeze. Slightly effervescent and very delicious.